Roxie and Felix sat on the branches of a tall tree, watching the accident unfold. She’d seen dozens of deaths now, carried as many souls to whatever was waiting for them. She still felt the loss of each and every one. “Does it ever stop feeling so tragic?” she asked, as a car pulled to a stop in front of a level crossing, waiting for the train to pass. “Knowing what comes after helps,” Felix replied. “The people they’re leaving behind don’t know,” Roxie pointed out. A car was hurtling down the road, swerving slightly, showing no signs of slowing down. “Loss is a part of the human experience,” Felix said. The train was growing closer. “Still, a family of four, all dead?” she asked. “I’ll take the kids,” he said. The swerving car collided with the back of the stopped vehicle, sending it lurching forwards, crashing through the barricade and onto the train tracks. The train’s horn blared, but it was far too late for it to stop. The force of the collision sent the car flying forward, rolling and bouncing until it landed in a crumpled, smoking heap beside the tracks. The train was screeching to a stop, but there was nothing that could be done. Roxie and Felix dropped from the tree, landing lightly on their feet, and approached the vehicle. Three spirits shimmered into existence around it. One must still be clinging to life, Roxie realised. Won’t be long now, though. She approached the parents, a moderately attractive heterosexual Caucasian couple, with fair skin and brown hair. They acknowledged her approach with a mixture of confusion and relief. Carol and Jason Farrow. “What happened?” Jason asked, his arm wrapped around the shoulder of his wife. “Are we… dead?” Carol added, glancing back at the wreckage. “And the girls?” Jason asked, his voice pained. “STAY AWAY!” a child’s voice screeched, cutting her off. It sent a chill down her spine, and she looked over to Felix, who had already drawn his rapier. Two girls, looking maybe six and four, were backed up against the car. The older one was standing in front of her sister, defiant and fierce. “No…” Jason said, staring at his daughters. “Uh, maybe we should wrap this up,” Roxie said, feeling a sudden spike of anxiety. “But our girls,” Carol said, hesitantly. “What’s going to happen to them?” Jason asked. I mean, it’s mostly true. Well, it wasn’t technically a lie. Hell basically served the same functions that people attributed to Heaven. The only reason it was called Hell was because… Actually, she didn’t know why it was called Hell. She knew it had about a dozen other names, but none of them were Heaven. There probably was a reason for that, but it didn’t seem important, or pertinent. “Okay,” Jason said, squeezing Carol’s shoulder. She leaned into him, smiling. Roxie summoned her scythe, collecting both of them in a single swipe. She could feel their sparks inside of her, and it was a comforting feeling. Every time she collected a soul, she felt connected to them, to the lives they’d once had, to her place in the universe. “YOU. CAN’T. HAVE. HER.” the older child was screaming, and Roxie turned in time to see Felix actually take a step back. The girl scared him that much? Why? “What’s going on?” Roxie asked, rushing to his side. As she got closer, she realised there was something different about the girl, though she couldn’t put her finger on exactly what. “She’s… not dead,” Felix said, eyeing the girl warily. “I don’t know,” he said nervously. “GO AWAY!” the girl shouted. There was weight behind her words, a force that even Roxie had to admit was a little frightening. 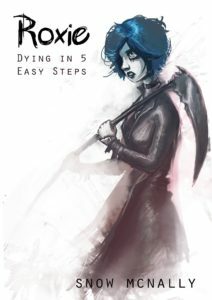 Roxie approached the girl, letting go of her scythe. It vanished back into her, and Charlotte relaxed a little, but still stood protectively in front of her sister. Sadie. “She’s staying with me,” Charlotte insisted. Charlotte folded her arms and shook her head. Her mannerisms were very much those of a child, but there was something else to them, something unnatural. “I’ll make her happy,” Charlotte insisted. “It won’t be good for her, Charlotte,” Roxie said gently. “You can’t take her,” Charlotte repeated, widening her stance. Roxie’s skin was crawling. Something was very, very off about this girl. “Distract her,” Felix whispered, beginning to circle around her. Bad idea, her instincts screamed, but she obliged. She had no choice. “Charlotte, talk to me. Are you afraid to lose her?” she asked. Felix stood behind Sadie, on the other side to Charlie. He moved quickly, thrusting his blade into the girl’s chest. It was faster than Roxie had ever seen him move. Did fear motivate him that much? It didn’t matter. However fast he was, the girl was fast. Charlotte whirled, grabbing his blade before it could touch her sister, stopping it. Fear burst forth onto Felix’s face, no longer concealed. “What the-” he began, but she cut him off. “MINE!” she shouted, the words booming out into the night. With a single, savage movement, Charlotte grabbed the sword with her other hand, and snapped it in half. Roxie watched as Felix convulsed, as if his spine had been shattered, and he collapsed to the ground. Charlotte stood over him, cuts appeared all across her body. Blood flowed out of the wounds, circling around her, a gruesome aura that effectively doubled her size. Roxie could feel fury emanating from her in waves, and she was barely able to move. Helpless, she watched as Charlotte picked up Felix, holding him in the air before snapping his neck and tearing him in half. She flung the two halves away from her, though they disintegrated in the air before getting very far. Felix is dead. This girl, this thing, just killed a Reaper. In that moment, she realized it wasn’t Charlotte she was looking at. There was something inside of her, something very dangerous, and very powerful, and very angry. Something Felix had just pissed off. If she wasn’t careful, it would kill her, too. “What are you?” she asked it. “CHARLOTTE LOVES HER,” it said. “I need to-” Roxie began, but she was interrupted by the appearance of another young girl. Fair skin, lilac hair, deep purple eyes. The girl from the hotel? Before I died? “Who are you?” Roxie asked, certain it couldn’t be the same person. “The Child. You collected my soul,” the girl said. “How?” Roxie asked, still staring at Charlotte, or the Destroyer, or whatever that thing was. It seemed content to simply stand over Sadie, protecting her. “I can’t leave a soul here,” Roxie said, summoning her scythe. If she had to fight both of them, she would. Even if it meant ending up like Felix. “You don’t have a choice,” the Child said. “I can-” Roxie began, but the Child interrupted her. “What are you doing here?” she asked, one of a thousand questions racing through her mind. “Protecting an investment,” the Child replied. Roxie tried to move, but the Child was faster. Her movements were graceful, fluid, and completely inhuman. All it took was a single finger, placed on Roxie’s forehead, and everything around her faded to nothing. A blink of her eyes, and she realized she was back in the clearing, now in the midst of winter. The souls of Jason and Carol Farrow had left her. Felix was gone. She lay there, staring up at the black and purple sky, snowflakes landing gently on her skin. Who was Charlotte Farrow, really? What was she? And who was that girl? If she was lucky, it would be a very long time before she had to see either of them again. So there you go! That’s the end of our 5 week hiatus, and the bonus story that filled the space. I hope you enjoyed it! It’s a bit weird, but it’s all important in the end. Anyway, if you’ve enjoyed the story so far, consider supporting me on on Patreon, so I can afford to keep writing it. Additionally, you can buy the complete collection of Impact Day on Gumroad. It features a bonus chapter that I’m not releasing online! Also, you can get Roxie as a standalone purchase. Next Week, Dead Girls Don’t Cry begins! It’s basically like Impact Day, only set earlier, and more full of personal drama and angst. I hope you enjoy it!